The unconventional appearance of Edwardian Lanchester cars must have counted against them to some extent in period, as even more so it does today. This photograph is very much a ‘Snapshot’, as it clearly is un-posed. It’s a fair guess that the driver of the car was also the photographer, as his passenger has turned to look at the camera. 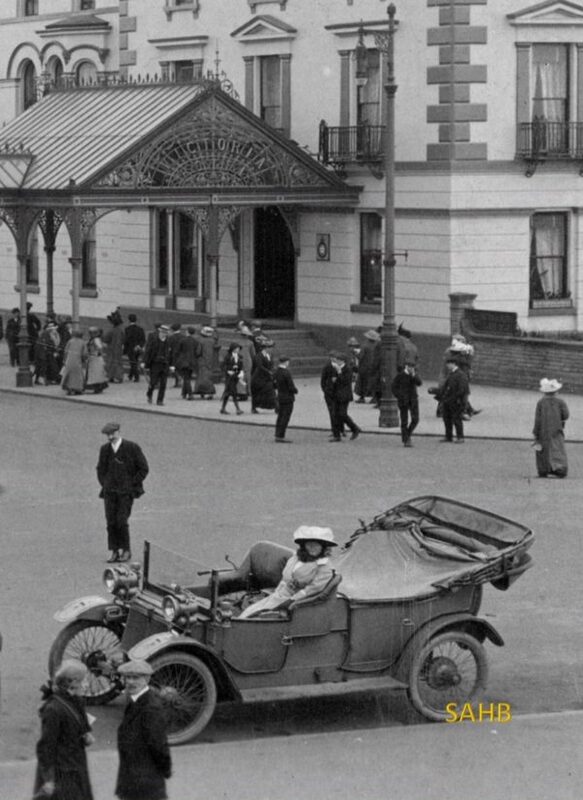 The location is Southport, Lancashire, with the ornate canopy of the Victoria Hotel (still struggling on today) as a backdrop on what evidently was a busy scene. The Lanchester seems to be rather travel-stained, and not a new car. Tiller-steered, it would appear to date from somewhere in the region of 1907-9, when the smallest model in the range was the 28hp with markedly over-square engine dimensions of 102 x 76mm. This model was listed from 1906 to 1911. The original thought and fine engineering ought to attract today’s enthusiasts, but although made in appreciable quantities, few Edwardian Lanchesters exist today. The VCC listings have only about ten surviving examples between say 1906 and 1913. This is delightful and perfectly captures the scene. I love the impression it portrays with individuals going about their daily business contrasting with the relaxed pose of the lady in the car attracting the attention of an onlooker.